When you think about handmade pap, three names come to mind: Origamido, Unryu and Lokta. We had already reviewed the first two, so it was time to complete the trio. Nepalese handmade Lokta paper is made from the fibrous inner bark of high-elevation evergreen shrubs primarily from two species of Daphne: Daphne bholua and Daphne papyracea, known collectively and vernacularly as Lokta bushes. These bushes proliferate in open clusters or colonies on the southern slopes of Nepal's Himalayan forests between 1,600 and 4,000 m (c.5,250-13,000 ft). 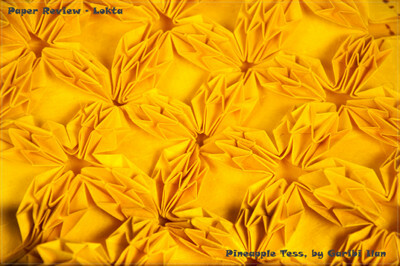 Historically the handcrafting of Lokta paper occurred in the rural areas of Nepal, most notably in the Baglung District. Today raw Lokta paper is produced in more than 22 districts in Nepal, but finished Lokta paper products are produced only in Kathmandu Valley and Janakpur. 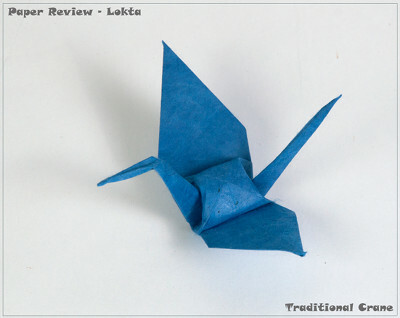 Lokta paper's durability and resistance to tearing, humidity, insects and mildew have traditionally made it the preferred choice for official government records and sacred religious texts. As with most handmade pap, Lokta has long fibres and the slow cleaning process is intended to keep the fibres whole, long and unbroken. This results in a high quality product, but there is a price for such long fibres - can the paper hold a crease? 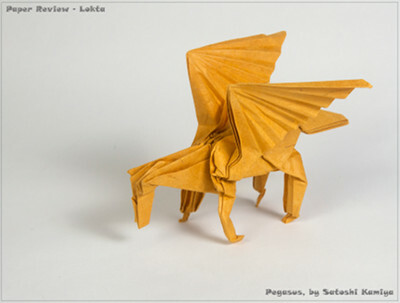 We immediately realized that Lokta isn't suitable for simple action folds or modulars, and as such no results for these models are given here. 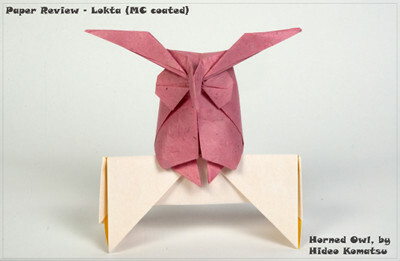 We concentrated our testing on the genres that are more suited to Lokta's properties: more 3D animals and complex models. Thickness: The measured weight is 50 gsm. The thickness measurement is ~160 microns, but – as it is handmade - this will differ depending on the place you measure. This is a little thicker than Kraft and Onion Skin pap. 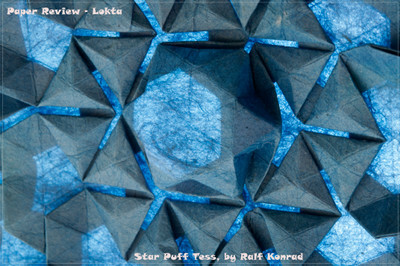 Sizes: There is no official size, but Lokta is available in sheets of 45cm×45 cm; 50cm×60cm; 50cm×65cm, and other sizes. Colors: Many colors, usually bright and strong. Paper Coloring or Colorability: With such a large variety of colors available, there is no real need to color the pap (other than for duo). However, after coating with MC and leaving to dry, the paper curled a little. It flatten again after a night under heavy glass. It also changed proportions enough to be noticed. Coloring would have similar effects. Texture: Uneven. The fibres are visible, and back light shows a cloudy sky. Some pap (e.g. the brown) have a leathery look and feel. Oth feel like fabric in places. Photogenic: The texture is like animal fur. The colors are strong and you can see the fibres and the bark residues. The finish is matte, so there is no reflection from your light source. This all guarantees that images of your models will show the rich character of this paper. Aging and Wear and Tear: This paper is the strongest paper we have seen by far. It scored 2100 and 1994 in the tear machine. For comparison, the next strongest paper, Tissue Foil, scored ~1300, and Unryu only 1000. 10 out of 10. Memory: Below average. I tried the Preliminary-to-Waterbomb test, and the paper hardly moved. The resulting waterbomb base was rather flat and shallow. Crease lines can be felt, but just barely. Only 6 out of 10. Forgiveness: With memory so low, one would think that reversing a fold line would be difficult. Surprisingly it is quite easy. 7.5 out of 10. Tensile Strength: We refer here to the maximum stress the paper can undergo while being stretched or pulled. With the grain, the paper can hold up to 20kg before tearing. 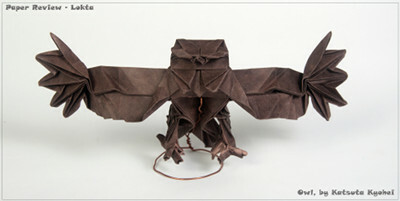 This is second only to Origamido, which can hold up to 21kg. 9.5 out of 10. Bending Resistance: This section rates the amount of force you need to apply to get a sharp crease and how strong the paper is while being curved. With numb between 50 and 35, Lokta is in the same range as Japanese Foil. 6 out of 10. Many art shops stock it, so it's always worth taking a look! Too sophisticated for simple uses. The first sense you get is that the paper is soft. It's difficult to get a sharp beak or wing tip and, when stretching the wings to the sides, the top part resisted my attempts to get a lovely curved line. Hard to fold, but the final product is beautiful. Great shadows with back lighting. The 32-division grid showed more shortcomings of this paper. Although it breaks both ways easily, there was a lot of residue from the bark that really annoyed me. The collapse was no real problem, but the paper is too soft. I finished the first stage and started to make the small triangles, with a good response - the paper breaks and stretched easily. The puffing of the star, though, showed the problem of soft paper - it was a little hard to make them stand out as there is no sense of snap-into-place with it. Not easy to fold, but worth the effort. Using the yellow sheet, I started with no real problems. Yes, it's a soft paper, but still it kept the fold lines and gave enough resistance. Even the open sink went smoothly. And then lay started to accumulate. The legs and the abdomen were difficult to do as the paper kept unfolding itself. This was not fun at all. More frustration came with the final details, as I found the paper much too soft to be moulded at will. I squeezed the hooves hard, hoping that it would hold. The final model is interesting, given the paper texture, but without any strengthening treatment it looks messy. The texture really enhances the model. 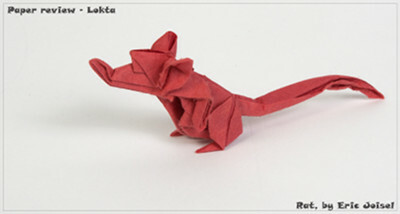 The paper size is 45cm, and it comes folded in half, so I used it like that, although usually I fold this model from 35cm. I chose the dark brown side that had the leathery look for the outside. The uneven thickness of the paper is immediately apparent. The thicker parts break visibly and some residue of thick bark may also disturb a little, but the steps are flying past! This paper is so foldable! Maybe it's the size, but it's a pleasure. The first speed bump is sinking the talons; this portion of the sheet is softer, fabric like, and the execution is slower, yet still possible with no real problem. Again with the wing tips - manipulating so many lay was done against a lot of resistance and the lay kept opening up. I managed to fold the legs, but the layering of the wings' feathers was hard. This paper is not like most of the others in the pack; I guess the color gave it stability. The final model is impressive. Lokta folds well enough, but stays too fluffy. I went for the pink option. This paper came from the same batch and immediately showed the differences from sheet to sheet. It feels soggy; creases tend to open up unless you hold them. It's foldable, but the feeling is very soft. The softness was irritating while trying to give it a 3D look at the end. The sides of the body jumped back again and again. The final model just begged for some MC to keep itself from opening up. 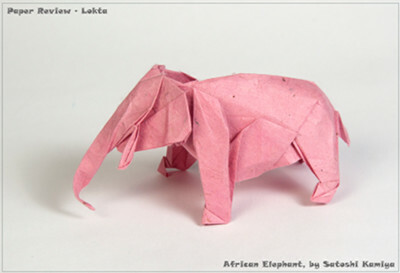 Lokta can hold a 3D shape. After buying his second book, this model looked like a great candidate to check 3D animals. With a memorable reference to Dumbo, I chose pink. The first steps went OK, although it was difficult to maintain sharp points for the tusks. Even the sinking (twice) went well. The neck stayed whole unlike the Tant model I made which tore at the neck. A miniature rat suffers from the resistance of the paper. I like to fold this model from a relatively small sheet. 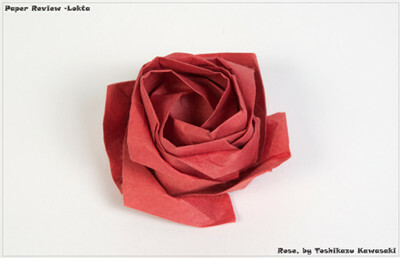 In the first stages there are some reverse folds to do, and as soft as this paper is - it is harder to reverse it. Trying to mould the model into the desired shape is almost impossible. The final model tends to open up and is unstable. After a few days in the jaws of a wooden pin, I managed to prepare it for the photo shooting. The petals uncurl, but the look is very nice. Again, I found it hard to maintain the shape I wanted. I couldn't even collapse it accurately, since the marks are not strong enough; this paper is low on memory. A little MC really improves Lokta's properties. As the paper is too soft, and in order to give a full review here, we realised we had to loosen our principles and test it after treatment in MC. The paper shrank to 23.3cm×23.4cm from its origin of 23.5cm. I had to cut 1mm from the longer edge. The sheet dried in about 10 minutes and after one night under heavy glass, was flat and ready. Folding the paper after MC treatment provided a better experience. It's easier to reverse and manipulate fold lines. Shaping the full curve of the body went well, although the ears didn't stay where I wanted them. An undeniable improvement but the softness is still evident. It's an iconic paper. I had heard about it many years before I held it my hands. Now, I can say it has many good reasons to be iconic. Mainly - it's the look; the texture, the big variety of colors, the long fibres, all promise you get a beautiful paper. Secondly - it's strong, super strong. Both reasons make it a hit among paper lovers, but for us paper fold, there are some distinct weaknesses. The main one is its resistance to folding - it becomes a clash of wills - yours and the paper. I am glad to say that we won. Add MC to your side, and your victory is assured. This paper is almost exclusively bought for complex and 3D models, not for simple models, nor modulars. You can use it for tessellations to get a remarkable folded surface, but it really goes well with animals. It's thin enough for multi layer models, and if you treat it with MC before folding or even only in the shaping steps, you will overcome most of its shortcomings. 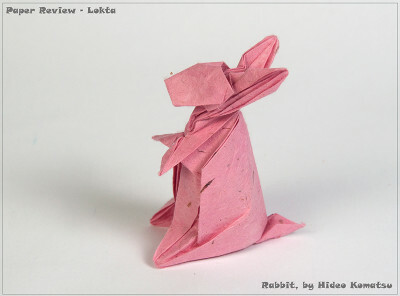 On Flickr, I found more than 550 images of Lokta, 80% are animals up to complex level; the rest are tessellations and a lovely number of proud own showing their collection of unfolded Lokta pap. The score is not sky scraping, but it is misleading. The beauty of it is evident, and to really exploit this paper you have to treat it right and choose the right model. It's a solid paper that will last for many years, stronger than it looks, and with many benefits. Bottom line: it's a must buy for intermediate to complex animal lovers! Do u think it should be better with MC Glue? Although i've never treated a paper with MC Glue... When treating papers, do i treat it with MC Glue on both sides or just one? 1. When treated with MC glue, does the paper hold the shape nicely and not like spring back? 2. Does the finishing touches of a model need shaping with glue or is it fine? 3. Is this a good paper for super complex models wherer the layers get really thick and u need it to hold the shape?